Libation in hand, the group convened at the appointed 6:30pm hour. This year, our local hub showed the best attendance yet with at least 20 people turning out for the festivities. There were several friendly faces from last year’s gathering as well as many newcomers. 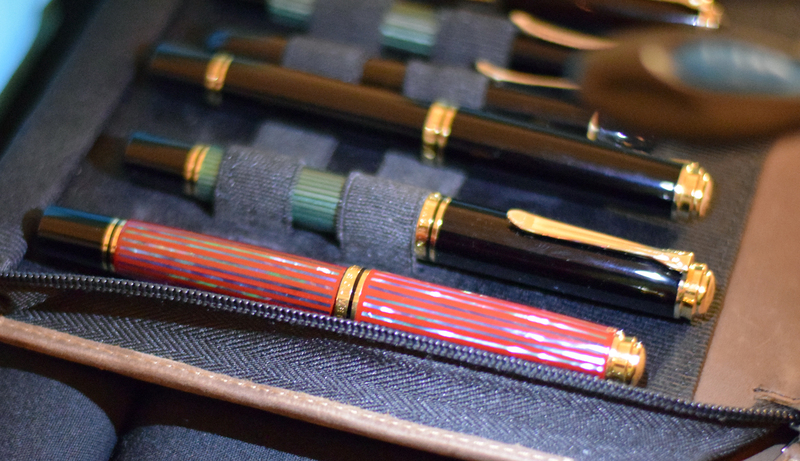 Veteran or novice, it seemed that everyone quickly fell into an easy grove, united by our common interest in fountain pens and all things Pelikan. Some people turned out with their whole collections, formidable flocks indeed. Several rare special edition releases were represented. 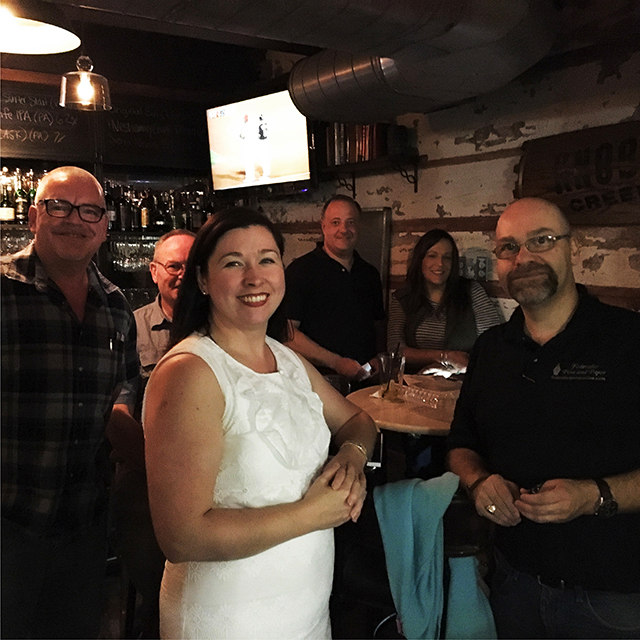 A few attendees had yet to purchase their first Pelikan and used the experience as a chance to better understand the landscape of available models. I’m always delighted by the generally good natured and friendly people who participate in our hobby and this hub embodied that. One interesting foot note is that we had a neat family connection this year with a father and son each participating but attending hubs 1200 miles apart from one another (Philadelphia, PA >> Minneapolis, MN). As an added resource Frank, a local collector and the retailer behind Federalist Pens and Paper, attended our hub and brought some of his wares for perusal and purchase. Up for sale were the M205 Amethyst, Aquamarine, and Blue Demonstrator. While all three are great, I’ve grown quite partial to this year’s Aquamarine release. While Pelikan did not provide a set of Edelstein inks for sampling like last year, they did include some nice swag for hub goers. 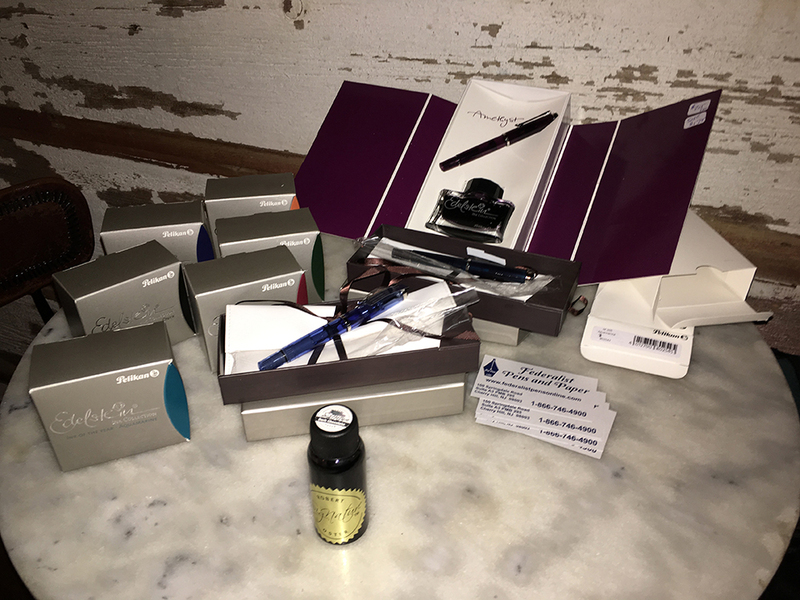 Every attendee took home a flacon of Edelstein Aquamarine ink, a Pelikan hubs themed notebook, an Aquamarine postcard, and a pen slip designed to be fitted to a notebook. I was also able to supplement this with some of last year’s left over swag including several tins of Amethyst ink cartridges. 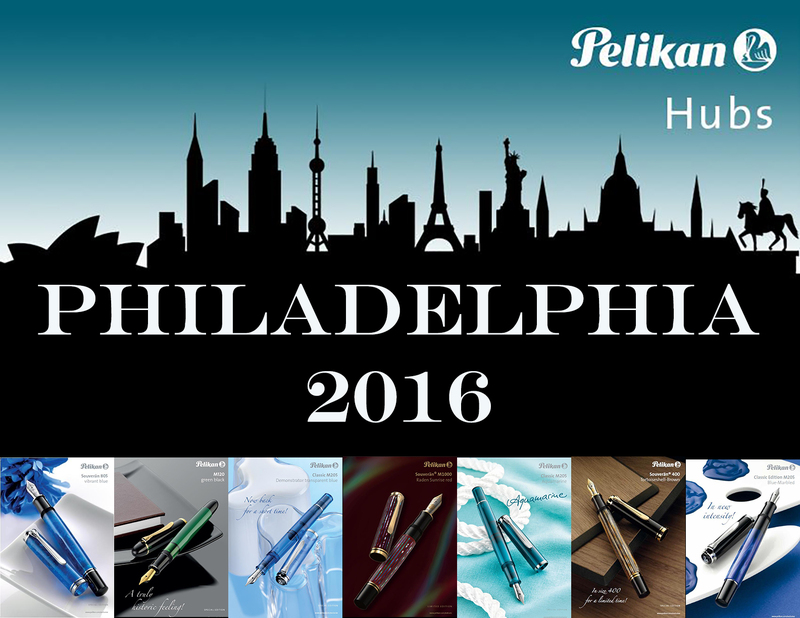 Pelikan Hubs 2016 swag. The porcelain Pelikan stand was not part of the give aways. There were some regional variations in gifts due to the overwhelming registration this year. I again took the opportunity to share my entire flock with the group. It’s not often that my collection gets to stretch its wings. I had a great time relaying much of what I’ve learned over the years as well as being able to help identify one or two mystery pens. There is nothing like being able to discuss a brand that I’m passionate about with fellow enthusiasts face to face. Sadly, it doesn’t happen often enough and I’m already excited for next years event. Not to exclude anyone, there were also several non-Pelikan pens in attendance which allowed us the opportunity to compare and contrast the best and worst of each. Their inclusion brought some much welcomed diversity to the event. The gathering ran from 6:30-9pm and I enjoyed myself so much that I actually forgot to order dinner. I think that Pelikan would be well advised to continue hosting this event for the foreseeable future. I certainly have some suggestions on how to better equip the hub master to deal with the challenges of the position and have shared those with the company. Despite a few issues on the back end, I think this year was a resounding success. Check out all of the photos from the Hubs around the world on your preferred social media via the hashtag #PelikanHubs or see them aggregated at Walls.IO. Sorry it didn’t work out for you. Hopefully next year. Thanks for coming! Enjoyed meeting you as well. Already excited for next years event. Thank you for the write up and photos. It gives us an excellent mental picture of your event in Philadelphia. As for my location, it was fun, my first time attending the Pelikan Hubs. Most folks seemed to know each other either thru pen shows, local pen groups or social media. The highlight for me was when a local expert told us about the history of Pelikan (the brand) and the tortoise varieties. I remember had read some of the information from your articles; so it was enjoyable to refresh my memory on some and to gain new knowledge on other – subjects on all things Pelikan. Driving through Golden Gate Bridge yesterday around 7 p.m., flocks of pelican were heading home. These majestic creatures are simply beautiful. They love to fly high up by the bridge tower. The shape of their beaks almost looks as if they are amused to look upon us human who are stuck in a slow traffic jam while they freely glide through the fog high and low. When Pelikan named their brand, they must have also been admiring the fascinating characteristics of these wonderful birds. Sounds like you had a great time. Thanks for sharing! This was my first hub and I had a lot of fun. Our location (Minneapolis) had about 9 or 10 participants, including my wife and me. None of us had a Pelikan collection as extensive as some of you guys in Philly, but there were some nice birds around and my wife was very happy that her new M400 Tortoise Brown arrived the day before, just in time for her to show it at the hub together with her other M400’s. It was fun to talk about the birds, and other pens as well, with such a nice bunch of people. I am also looking forward to next year’s hub. Big thanks to Pelikan for organizing the hubs and to all the hub masters for putting in so much effort to guarantee that we all have fun. Do you mind sharing what are the pen cases that you have in the photos above? Particularly that one with the M800’s. Glad to hear that you enjoyed the Minneapolis hub. Your son filled me in on the “family affair” and it only goes to show that you raised him right. It was a pleasure meeting him and I think it was very neat that your family got to participate in separate locations. He said he was snapping some pics to send your way. Haven’t inked the Raden up yet but I will at some point. Have the M400 Tortoiseshell Brown inked up at the moment. The pen case that the M800s are in is a 20 pen case made by Pelikan in the 1990s. These aren’t easy to come by but turn up on eBay from time to time. They were made in a bunch of different sizes. Unfortunately, when you do find them, they are rather pricey. You have incredible self-control for not inking that raden! I think the longer I can resist to ink a new pen is 10 min :). But then again, I don’t have any pen that comes even close to the Raden. I’d like to think that I was able to teach a good thing or two to my son, and an appreciation for Pelikans is certainly one of them (although, I’m disappointed that he just bought a MB 146. High treason! 🙂 ). Thanks a lot for the info on the Pelikan case. They seem perfect for M800s. Thanks for sharing your Amsterdam experience. Always great to read about the fun at other sites and see what other ideas are out there for improving the hub. I was thrilled to be able to attend the event in Toronto. I saw some terrific pens, met some great people, and as always, learned so much. I even met someone who might be able to fix my broken Pelikan nib (I caved and bought a new nib so this is not crucial but it just bothers me!) I confess I had no idea how deep the entire fountain pen rabbit hole is…and on that point, I wonder if anyone knows what the paper is in the notebook that Pelikan gave to participants. I have almost gone through mine, enjoying it as a lovely paper. The rabbit hole runs deep indeed. 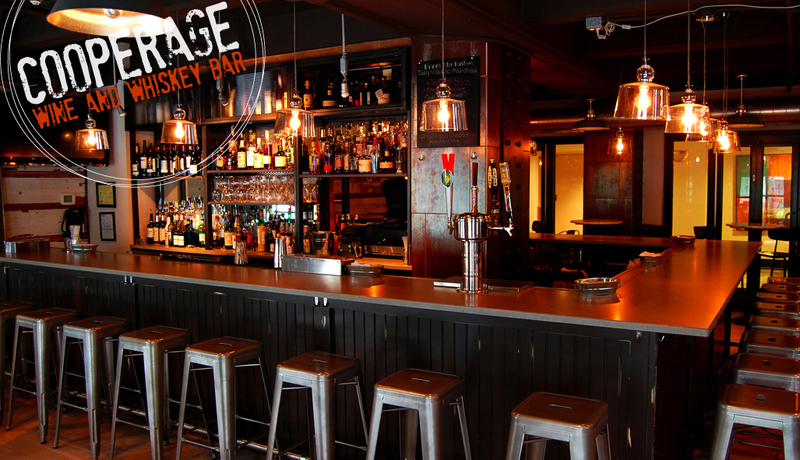 Glad to hear that you enjoyed the Toronto Hub. I agree that the paper is nice but have no clue what it is (I’m more of a pen than paper connoisseur). Perhaps you could find the answer by emailing hubs@pelikan.com. I’d be interested to know as well. Sorry for coming back to you only now. We are so happy that you enjoyed this year’s Pelikan Hubs and liked the gifts we provided to the 109 Hubs around the world. It was an amazing event and we appreciate that Hub Masters as well as attendees made a simple gathering to a wonderful event again! We regret to tell you that unfortunately we found out that the wholesale dealer, we bought the paper pads from, only sells its paper to print companies. Nevertheless, we don’t want to withhold the information we got from that dealer. The name of the paper is “Edelweiß” and its grammage is 100g/m2. Thanks for the follow-up! Sounds like those note pads are going to be a one off and not available again which I guess just makes them extra special. Done! Will let you know if I get a reply.